I’m going to ask you a question. Quick, name one infamous historical duo. Okay, time’s up. Who did you say? 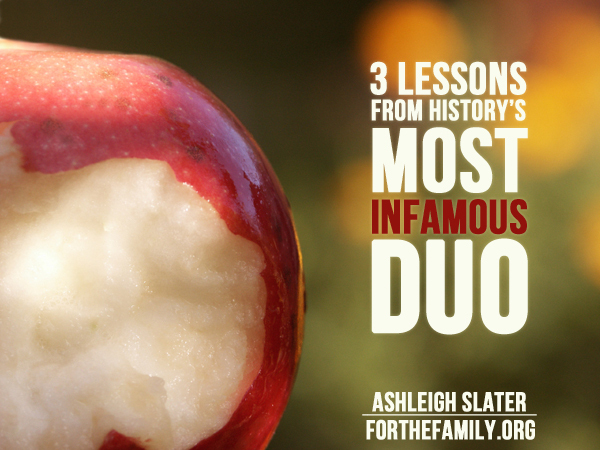 While these two are often remembered as the world’s most scandalous fruit eaters, remarkably skilled at casting blame and innovative in the area of fig-leaf clothing design, when it comes to our marriages, we can learn a lot from this original duo. During those early sin-absent days, Adam and Eve model for us God’s perfect design for our husband and wife relationships. This God-created, God-ordained team point us to qualities toward which we should strive in our post-Fall marriages. Because, here’s the thing: the introduction of sin didn’t null and void what God’s perfect design was for husbands and wives. In those beginning days, marriage was His joining of a man and a woman together for the purpose of bringing Himself glory. The advent of conflict didn’t change that. It just made things more complicated. More difficult. Sure, it’s well known that Adam and Eve shared both a rib and that off-limits piece of fruit. But think about what else they had in common. For example, life goals. This included having kids and caring for the Garden and God’s creatures. Oh, and that little thing called survival. After all, there was no local Target in Mesopotamia at the time. Just as it did in the beginning, unity matters in our marriages. A lot. Jesus told the scribes, “If a house is divided against itself, that house will not be able to stand” (Mark 3:25). As husbands and wives, God desires us to not allow discord to divide us, but to do our best to walk in unity with each other. Adam and Eve worked together to accomplish these shared life goals. With unity came cooperation. Prior to the Fall, I imagine teamwork was seamless. It wasn’t until afterward that common goals were interrupted by personal ambition. Team decreased, player increased. Sure, Adam and Eve may have been the only two people alive then. Even so, they were fully committed. 100%. There was no Plan Beta. There wasn’t even a Plan Alpha. For them, it was the only plan. After God presented His first woman to His first man, Scripture doesn’t record either of them stopping to wonder if their “soul mate” was still out there. You know, somewhere beyond the boundaries of the Garden. In the post-Garden reality, it may seem the odds are stacked against you. But you don’t have to be an infamous couple. With God’s help, your marital story — and mine — doesn’t have to end in a metaphorical flurry of metaphorical gunfire. When we walk with the Lord, as Adam and Eve once did, our marriages can proclaim the beauty of that first, pre-Fall relationship. Enter to Win a copy of my new book! Do you want more ideas on how you and your spouse can be intentional about growing together? If so, I’m giving away a copy of my new book Team Us: Marriage Together from Moody Publishers to two winners. Enter below for a chance to win. We do have a lot to learn from Adam and Eve. I would like to win it to share with my friends who have difficulty in their marriages as I try to counsel with them. I am so blessed to have a Godly husband who definitely understands the “us”. Adam and Even show the true meaning of love. They work, live and were totally committed to each other. In live (in the garden) and in death (after the fall). Thanks for sharing your word and work with me. I would love to get a copy. I need some reminding that I’m a wife before a mommy! Working as a team is an area where I would like to grow in my marriage. This is a book I need and maybe I can get my husband to read along with me. I believe in Team Us! I was very encouraged to learn more of your informational writing that you’ve shared with this article & would love to read more of your work by winning a copy of your book. My wife & I help people with marriage difficulties & new info is always worth investigating.